Posted Thursday, August 2, 2007. 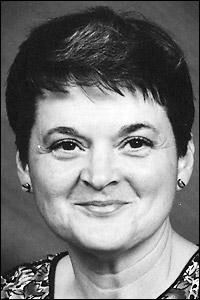 Carolyn Dromgoole passed away Monday at the Willamette Valley Medical Center in McMinnville. She was 60. Nancy Harris informed us that she had Huntington's Disease. She was born to Elwyn and Helen Voge Obert in Corvallis. She grew up in Corvallis and graduated from Corvallis High School. She met Gordon Dromgoole during her freshman year at Oregon State University. They were married on Sept. 10, 1966, in Corvallis and moved to Yamhill in 1967. She held various positions with time out to raise the boys. She was a secretary in OSU’s Horticulture Department, administrative secretary for the state veteran’s affairs office in Yamhill County and secretary at First National Bank, Yamhill and Carlton branches. 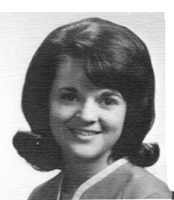 She also worked in the insurance industry and was the farm bureau secretary. Carolyn was an excellent seamstress and also enjoyed crafts, camping, making beautiful candles and playing cards with family and friends. She was active in the Yamhill Christian Church then the First Baptist Church of McMinnville and was vice president and secretary of the Yamhill County chapter of the National Alliance on Mental Illness. Carolyn was preceded in death by her mother, Helen Voge Obert, and sisters Gail and Joan. She is survived by her husband, Gordon Dromgoole of Yamhill; sons Kevin George Dromgoole of McMinnville and Darren Lee Dromgoole of Lake Oswego; her father and step-mother, Elwyn and Donna Obert of Corvallis; and one grandson. Memorial contributions can be made to Yamhill County Mental Health or the Yamhill County Chapter of the National Alliance on Mental Illness, c/o Macy and Son Funeral Directors, 135 N. Evans, McMinville, OR 97128. Click here to see Carolyn's last Profile entry.